Bookings were be taken on a ‘first come first served basis’ and the same booking method / notification used for recent events have been used. Pitch prices remain unchanged from the most recent Indoor events at the museum. N.B. Pre-booking was essential as there will be no spaces for people just turning up on the day. The stallholder pass system will be retained for this event, to include stallholders and their helpers. This is to help control how people enter and leave the site during the event and stallholders need to order the passes they require in advance of the event; and to forward them to the person using the pass. Gates will open at 7.00am for sellers to set up and the public are admitted at 9.00am these times will be strictly enforced. It is now written into the Terms & Conditions that ALL sellers remain on site and selling until 2.00pm. A special admission fee of just £4.50 per person will be in use on the day; this is to recognise that some stalls in Hangar 2 are in front of the exhibits, which means that they cannot be viewed or photographed in the normal manner. We suggest that you arrive early to seek the best bargains. 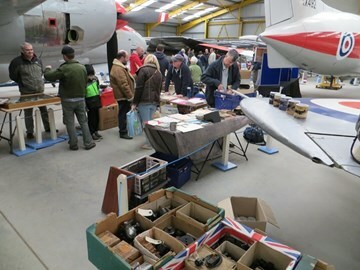 Sellers lists will be added to the website quite soon, so get ready to engage into some ‘face to face’ aviation trading at Newark Air Museum.